I have been principal of Del Mar now into the 8th year. I feel blessed to be a part of this community. Thank you for everything you do each day to support our scholars! Together, as a team, we are Giant! Recently I have become very concerned about this generation of scholars. I have been researching a lot to get to the bottom of my thoughts regarding why, more and more, we hear from parents and teachers that students are bored, act entitled, have little patience, and struggle with friendships. As I spent a lot of time reading, a particular article really stood out for me. Please bear with me as I bare my soul, over the next 3 newsletters, about my worries for our beautiful and amazing children! Technology To Keep Them Busy: Technology, especially with younger children, impacts the nervous systems of our scholars. Children that spend a lot of time gaming and on screens, can experience attentional issues. Part of what happens is that they also lose the ability to be able to wait. They struggle with even waiting for rewards and gratification. What happens on a screen appears to be very exciting. Kids that spend a lot of time engaged with their phones, their screens, or their games can feel like everyday life is boring compared to virtual technology. When students have spent a lot time over the weekend or in the evening on a screen, (this includes the phone) processing information in a classroom can become challenging. The classroom is a place where students become a part of a group and student collaboration. Participating in learning is very different than experiencing a lot of graphic explosions and special effects that students might see on a screen, in a video game, or in the drama of Instagram, Music.ly, and Snap Chat etc.. Overuse of technology can also disconnect children emotionally from their family. Have you experienced a lack of communication after your child has had a lot of screen time? This is a common occurrence for us with our phones as well. Will you join me in a challenge? The Pull the Plug Challenge begins the first Wednesday of December! Pull the Plug is a weekly family night without screens. Each week, you as a family can choose to spend one evening engaged together with family activities such as: Board games, family history discussions, and physical activities. Your scholar’s teacher will have a special form that you and your child can take home, fill out, and place in the White Challenge Mailbox housed in our office!! I will be reading your “Plug Pulling Adventures” each week during the DM Morning Announcements. If you need to borrow games, just let me or your teacher Know! If you have any suggestions, thumbs up, or ideas, please fill out this form and bring it to me, in the office!!!!! I want to know what you think!!!!! He sido director de Del Mar por ocho años.. Me siento bendecido de ser parte de esta comunidad. ¡Gracias por todo lo que haces todos los días para apoyar a nuestros estudiantes! ¡Juntos, como equipo, somos Gigantes! Recientemente me he preocupado mucho por esta generación de eruditos. He estado investigando mucho para llegar al fondo de mi mente con respecto a por qué, cada vez más, escuchamos de los padres y maestros que los estudiantes están aburridos, actúan con derecho, tienen poca paciencia y luchan con las amistades. Como pasé mucho tiempo leyendo, un artículo en particular realmente se destacó para mí. Por favor, tengan paciencia conmigo cuando descubra mi alma, en los próximos 3 boletines informativos, sobre mis preocupaciones por nuestros hermosos e increíbles niños. (El documento principal, de muchos artículos que he estado investigando, está escrito por Victoria Prooday, OT). Tecnología para mantenerlos ocupados: la tecnología, especialmente con los niños más pequeños, afecta el sistema nervioso de nuestros estudiantes. Los niños que pasan mucho tiempo jugando y en pantallas, pueden experimentar problemas de atención. Parte de lo que sucede es que también pierden la capacidad de poder esperar. Luchan con incluso esperar recompensas y gratificaciones. Lo que sucede en una pantalla parece ser muy emocionante. Los niños que pasan mucho tiempo conectados con sus teléfonos, sus pantallas o sus juegos pueden sentir que la vida cotidiana es aburrida en comparación con la tecnología virtual. Cuando los estudiantes han pasado mucho tiempo durante el fin de semana o por la tarde en una pantalla (esto incluye el teléfono), procesar información en un aula puede ser un desafío. El aula es un lugar donde los estudiantes se convierten en parte de una colaboración grupal y estudiantil. Participar en el aprendizaje es muy diferente a experimentar una gran cantidad de explosiones gráficas y efectos especiales que los estudiantes pueden ver en una pantalla, en un videojuego o en el drama de Instagram, Music.ly y Snap Chat, etc. El uso excesivo de tecnología puede también desconecta emocionalmente a los niños de su familia. ¿Ha experimentado una falta de comunicación después de que su hijo ha tenido mucho tiempo de pantalla? Esta es una ocurrencia común para nosotros con nuestros teléfonos también. ¿Te unirás a mí en un desafío? ¡El Pull the Plug (Noche de tirar el enchuufe desfaío) comienza el primer miércoles de diciembre! Pull the Plug es una familia semanal noche sin electronicas. Cada semana, usted como familia puede elegir pasar una noche juntos con actividades familiares tales como: juegos de mesa, discusiones sobre historia familiar y actividades físicas. El maestro de su alumno tendrá una forma especial que usted y su hijo pueden llevar a casa, completar y colocar en el enchufe buzón blanco en nuestra oficina !! Voy a leer tus "Plug Pulling Adventures" cada semana durante los anuncios de DM Morning. Si necesita prestar juegos, solo déjenme a mí o a su maestro. Reunión de ELAC: jueves, 30 de noviembre 2:30 p.m.
Concierto de música de 4to / 5to grado: 19 de diciembre 1:00 p.m.
Si tiene alguna sugerencia, pulgar hacia arriba o ideas, complete este formulario y tráigalo a mí, en la oficina. ¡¡¡¡¡Quiero saber qué piensas!!!!! What Can We Do or Say When We Are Met With Tragedy? Over the course of the past weeks, our children have been exposed to many tragedies. Tragedies here, in Mexico, and in other parts of the world. This week, the tragic event of the Las Vegas shooting was repeatedly visible on our screens. We all struggle with what to tell our children and our students. Especially when we cannot explain these tragedies. Following are a few thoughts and tips that might help with those hard conversations between you and your child. The way you respond to the unexpected and to tragedies molds whether your child looks at the world with fear or with hope. The discussions that you have with your child, when tragedy strikes, will give them a lens on how they view the world and the way that they really look at other people. Try to find positives that you can point out. When tragedy strikes there are always individuals that rise up and help others. Share examples of those heroic people that pitch in to fix things and protect others. Remind your child that most people wish to treat others with kindness. Have a filter. Choose carefully what you communicate. Depending upon the age and temperament of your child, think about carefully giving your child enough information to satisfy their curiosity. You do not need to share a lot of details surrounding a tragic event. It is too much for them to digest. Young children should not be watching the news. In our world, negative news events are played over and over on our screens. If news of a tragedy comes on while you are watching television, or on the internet, calmly change the station or the situation. Young children cannot fully understand what they are hearing and seeing which can cause them anxiety. Keep communication open and ongoing. Having these kinds of conversations with your child can be very uncomfortable. As a parent you always try to protect them and discussing situations where safety was jeopardized for others can be really really hard! However, by being open to discussing how your child is feeling, and answering their questions with the same simple message, you are giving them a safe space to process what they have heard or seen. Let them know that sometimes bad things happen in life, but that you are a family that is strong and able to cope with it. Home/School Club Meeting: Thursday, October 12th, 6:00 in the Library! Halloween Parade & 5th Grade Thriller Dance:	Tuesday, October 31st, 8:30 A.M.
¿Qué podemos hacer o decir cuando nos encontramos con la tragedia? Estimadas familias de Del Mar, En el transcurso de las últimas semanas, nuestros niños han estado expuestos a muchas tragedias. Tragedias aquí, en México, y en otras partes del mundo. Esta semana, el trágico evento del tiroteo de Las Vegas fue repetidamente visible en nuestras pantallas. Todos luchamos con qué decirle a nuestros hijos y nuestros estudiantes. Especialmente cuando no podemos explicar estas tragedias. Los siguientes son algunos pensamientos y extremidades que pueden ayudar con esas conversaciones duras entre usted y su niño. No evites el tema ... ... Diles algo. Es muy probable que su hijo oiga hablar del desastre o la tragedia de sus compañeros o sus pantallas. Se darán cuenta de que algo terrible ha sucedido. Mantenga lo que dice bastante simple y lo mismo cada vez que tenga la conversación. Usted puede decir, "Malas cosas suceden en nuestro mundo, pero hay un montón de gente buena por ahí ayudando a hacer las cosas mejor. Somos un equipo y pasaremos por esto ". La forma en que respondes a lo inesperado ya las tragedias moldea si tu hijo mira al mundo con miedo o con esperanza. Las discusiones que usted tiene con su niño, cuando la tragedia golpea, les dará una lente en cómo ven el mundo y la manera que miran realmente a otras personas. Trata de encontrar aspectos positivos que puedas señalar. Cuando la tragedia golpea siempre hay individuos que se levantan y ayudan a otros. Compartir ejemplos de esas personas heroicas que lanzan para arreglar las cosas y proteger a los demás. Recuerde a su hijo que la mayoría de la gente desea tratar a otros con amabilidad. Tienen un filtro. Elija cuidadosamente lo que usted comunica. Dependiendo de la edad y el temperamento de su hijo, piense cuidadosamente dando a su hijo suficiente información para satisfacer su curiosidad. No es necesario compartir muchos detalles en torno a un trágico evento. Es demasiado para ellos digerir. Los niños pequeños no deberían estar viendo las noticias. En nuestro mundo, los eventos de noticias negativas se reproducen una y otra vez en nuestras pantallas. Si la noticia de una tragedia se enciende mientras usted está viendo la televisión, o en Internet, cambie con calma la estación o la situación. Los niños pequeños no pueden entender completamente lo que están escuchando y viendo lo que puede causar ansiedad. siempre tratas de protegerlos y discutir situaciones en las que la seguridad se pone en peligro para otros puede ser muy difícil! Sin embargo, al estar abierto a discutir cómo su hijo se siente y responder a sus preguntas con el mismo mensaje simple, le está dando un espacio seguro para procesar lo que han oído o visto. Hágales saber que a veces las cosas malas suceden en la vida, pero que usted es una familia que es fuerte y capaz de hacer frente a ella. Junta de Club & Hogar:	jueves, 12 de octubre, 6:00 in the Library! Desfile de Halloween y baile de Thriller de quinto grado:	tuesday, 31 de October , 8:30 A.M.
Si usted tiene alguna sugerencia, pulgar hacia arriba, o ideas, por favor llene este formulario y tráigalo a mí, en la oficina !!!!! ¡¡¡¡¡Quiero saber qué piensas!!!!! If you have a TK, Kinder, 1st, or 2nd grader please plan to be in your scholar’s classroom by 5:15 as we hope to begin presentations promptly. It is very important that you attend this meeting. We will be sharing a great deal of important information regarding our school culture and all of the ways that you can be involved in your scholar’s school community!!! Traditionally, Back To School Night is an event that is attended by parents and other adults. It is very important that your scholar’s teacher has undistracted time to be able to communicate all of the expectations, as well as exciting learning, that will take place over the course of this school year. Your scholar should not be expected to sit through this. I understand that finding childcare is sometimes difficult. For our part, we will provide supervised activity rooms for those families that are unable to find childcare. The playground will be closed. Please call by Tuesday morning, September 12th, at the latest, to make a reservation. You will need to check your scholar into the reading room (#18) or computer lab when you arrive on campus. We are able to offer childcare for children 4 years old and up. If your scholar’s behavior becomes unmanageable, you will be asked to take your child home. scholars. We hope to see all of you at the Del Mar Back To School Night!!! estudiante a las 5:15, ya que esperamos comenzar las presentaciones prontamente. Es muy importante que asista a esta reunión. ¡Estaremos compartiendo una gran cantidad de información importante con respecto a nuestra cultura escolar y todas las formas en que usted puede estar involucrado en la comunidad escolar de su escolta! que no pueden encontrar cuidado de niños. El parque estará cerrado. estudiante se vuelve incontrolable, se le pedirá que lleve a su hijo a casa. eruditos Esperamos verlos a todos en el Del Mar de regreso a la noche de la escuela! Welcome!!! I am looking forward to the upcoming school year and the journey that we will embark upon together!Together, we will continue to develop a culture of Growth Mindset. Growth Mindset is an attitude towards learning. We believe that every student can be successful given the tools to develop confidence in their efforts. New research shows that the brain is really like a muscle!! When you lift things that are heavy, and practice doing this, your muscles begin to develop more and grow. Your brain does the same thing! It changes and becomes stronger as you use it!! In fact, scientists can now show through video and ultra-sound that the brain actually grows as you learn new things! Let’s think about how babies grow and develop. From the day that they are born, they are hearing a very busy world around them! They are trying, with their brains, to make sense of all the noise and language. Eventually they figure out the language of their parents. They do this through the practice of listening, observing, and thinking. Their brains begin to change and grow as they practice learning. This is why we focus on and praise effort! We do not think that babies are of low intelligence because they cannot talk. We think that they just cannot talk YET! It is the same with all students. Provide your scholar with a rigorous and engaging learning experience. Provide any needed additional support that your scholar needs to be successful. Ensure that your scholar is positively connected to Del Mar. Teach your scholar how to learn, give their greatest efforts, and grow their intelligence. Stay informed through our website and school/classroom newsletters. Call or email with any concerns or questions. Get involved by participating in school activities. Being at school every day, on time, with a healthy breakfast in their bellies. Consistent practice over time is how people learn best. Giving 100% of positive energy and effort every day! Smart is not something you are-it is something you become through effort. Trying their hardest when they experience challenges. Believing that they have the capacity to do great things! 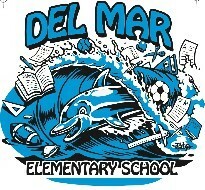 I am both humbled and proud to be the principal of Del Mar Elementary School. Through careful planning, dedicated and creative collaboration, and an unwavering commitment to support our scholars through every challenge, the Del Mar staff and community has created a learning environment in which our scholars thrive! Please know that I always welcome and benefit from both your involvement and feedback! Preschool & AfterSchool Care Opportunities: Are you looking for preschool or after school care for your students? We have free and low-cost preschool and childcare available at Del Mar School. Please call the Child Development Office at 831-462-1116 ext 207 or 275 to see if you qualify. Space is limited so call now. ¡¡¡Bienvenido!!! ¡Estoy deseando que llegue el próximo año escolar y el viaje que emprenderemos juntos! Juntos, continuaremos desarrollando una cultura de mentalidad de crecimiento. La mentalidad de crecimiento es una actitud hacia el aprendizaje. Creemos que cada estudiante puede tener éxito dado las herramientas para desarrollar la confianza en sus esfuerzos. Nueva investigación muestra que el cerebro es realmente como un músculo! Cuando levanta cosas pesadas y practica haciendo esto, sus músculos comienzan a desarrollarse más y crecen. ¡Tu cerebro hace lo mismo! ¡Cambia y se hace más fuerte mientras que usted lo utiliza !! De hecho, los científicos ahora pueden mostrar a través de video y ultra-sonido que el cerebro realmente crece a medida que aprenden cosas nuevas! Pensemos en cómo crecen y se desarrollan los bebés. ¡Desde el día en que nacen, están escuchando un mundo muy ocupado a su alrededor! Ellos están intentando, con sus cerebros, dar sentido a todo el ruido y el lenguaje. Eventualmente, se dan cuenta del lenguaje de sus padres. Lo hacen mediante la práctica de escuchar, observar y pensar. Sus cerebros empiezan a cambiar y crecer a medida que practican el aprendizaje. Esta es la razón por la que nos centramos en el esfuerzo y la alabanza! No pensamos que los bebés son de baja inteligencia porque no pueden hablar. ¡Pensamos que no pueden hablar TODAVÍA! Es lo mismo con todos los estudiantes. Proporcione a su erudito una experiencia de aprendizaje rigurosa y atractiva. Proporcione cualquier apoyo adicional necesario que su becario necesite para tener éxito. Asegúrese de que su becario está conectado positivamente con Del Mar. Enseñe a su erudito cómo aprender, dar sus mayores esfuerzos, y hacer crecer su inteligencia. Manténgase informado a través de nuestro sitio web y los boletines de la escuela / salón de clases. Llame o envíe un correo electrónico con cualquier inquietud o pregunta. Participa participando en las actividades escolares. Estar en la escuela todos los días, a tiempo, con un desayuno saludable en sus vientres. La práctica consistente en el tiempo es cómo la gente aprende mejor. Tener una temprana hora de acostarse. ¡Dando el 100% de la energía y del esfuerzo positivos cada día! Inteligente no es algo que eres, es algo que te conviertes en el esfuerzo. Intentando su más duro cuando experimentan desafíos. Creyendo que tienen la capacidad de hacer grandes cosas! Estoy muy orgullosa de ser la directora de la Escuela Primaria Del Mar. A través de una cuidadosa planificación, colaboración dedicada y creativa, y un compromiso inquebrantable para apoyar a nuestros eruditos a través de cada desafío, el personal y la comunidad de Del Mar ha creado un ambiente de aprendizaje en el que nuestros eruditos prosperan! ¡Por favor, sepa que siempre me da la bienvenida y me beneficio tanto de su participación como de sus comentarios! 22 de agosto: Listas de clases van a estar puesto a las 5:00 p.m. con una fiesta de palomitas. para grados 1 - 3 a las: 2:10 p.m., y para grados 4 - 5: a las 2:25 p.m.